At Fall Creek we have spent a great deal of time researching the purchasing and consumption habits of berry consumers and how that can carry over to home gardeners growing their own berries for harvest. In its September 2011 issue, Green Profit featured Fall Creek and our soon-to-be-released (January 2012) BrazelBerries collection of small fruit varieties. The article outlines small fruit trends and trends within the edible landscape segment as well. We are proud of this article and the work we've done in this area as it is not based on guesswork but rather years of careful research and breeding. Stay tuned for more details coming soon on our new BrazelBerries collection but in the meantime, read this article for more insight into these important trends. 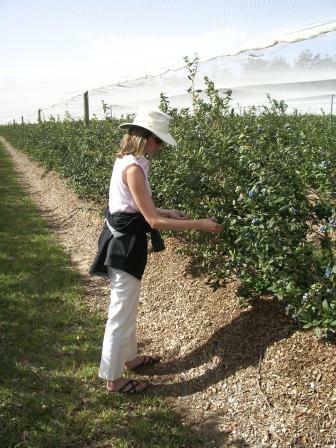 PHOTO: Amelie Aust, Fall Creek's New Products Manager, evaluating blueberry varieties at one of Fall Creek's research stations.